Buying a motorhome, RV, or campervan is a big decision, no matter what size or age you go for. There's a lot to consider and a lot of questions to ask. Having said that, we wish we'd bought our first motorhome 10 years ago! Let us show you why- here are our top 20 reasons to buy a motorhome. You'll go places you never even imagined! The sunsets/ stars/ nature are incredible! It could most definitely change your life! – I'm buying a motorhome for the first time. Help me choose! This is probably one of my favourite things about Motorhome travel- driving down the road and seeing a sign for something random (like an Ice Cave) and just being able to pull off and visit it without any fuss. No hotel bookings, no flights to catch, no stress, no timetable (except for maybe the journey back to the UK!) We love being able to meander wherever we feel like each day and explore whatever we find there. Reasons to buy a motorhome- you'll end up in some incredible places!! I've always been a ‘rusher'. I'll run around like a headless chicken, trying to get everything done. This includes being on holiday, where I have been known to create a schedule and cry big ugly tears when the ‘schedule' didn't go to plan. (“What do you MEAN you want another coffee? We don't have time to stop until 12 minutes past 4…” *true story*) It's a wonder I'm still married, quite frankly! But motorhome travel forces me to slow down. We can't travel around at 500 miles an hour. We can rarely detour around traffic jams. We don't even know WHERE we're going to stay that night most of the time, which used to scare me witless but now allows me to just relax. If my chauffeur wants a coffee or a little nap, I'll find us somewhere quiet or pretty and we'll chill until we fancy setting off again. This is all part of the adventure and it's FUN. Believe it or not, Motorhome travel is fun! Obviously, if you want to go to Europe, you'll need to book onto a ferry or the tunnel as early as possible to get the best rates, but otherwise there doesn't need to be any plans made in advance. We've explored Wales and Cornwall last minute in the school holidays without any issues finding overnight spots or campsites. We also went to the Italian lakes in August without booking a single campsite- and then unexpectedly went up to Switzerland. We're leaving for Norway in less than 6 weeks and I have NO idea where our first stop is going to be. It's perfect for lazy planners– or people who are recovering uber-planners! Do you think there's a 7-step programme for that?? Why did we buy a motorhome and not a van? Because I wanted a proper bathroom (among other reasons.) I wanted to be able to stand up and have a shower and use the toilet without going outside. That's probably one of my top reasons to buy a motorhome! I love having a proper bathroom and toilet- it makes everything so much easier. And if it's easy, it's fun. If we're driving and see somewhere pretty to have lunch, or just want an afternoon nap, we can do that! If we see a chocolate shop or a trinket shop, we can stop and browse for as long as we like, knowing that there's no rush to get anywhere else. We can chat with people over dinner or spend time getting to know new friends without having to rush off anywhere. When we head off for an adventure, we never know where we're going to end up. We set off for Italy, and by the end of it we'd seen the Milky Way from Switzerland and had lunch in Liechtenstein. We also set off for Norfolk and ended up in Cornwall… don't ask! But the plans can be as flexible as you are! Reasons to buy a motorhome- sleep under stars like you've never seen before! I'm not sure there's anything better than waking up in a new place with an incredible view, putting the kettle on and enjoying a bacon sandwich made to your exact preferences. Having a kitchen which travels with you is great- you don't have to eat out every night if you don't want to, you can eat a smaller meal if you feel like cheese on toast for dinner. It's so easy- even doing the food shop is easy as you can put it all away straight in the supermarket car park. Or if you get stuck in a massive holdup (like say, the Eurotunnel on a bank holiday weekend!) then you can make a brew, and give the upset kids in the car next door some squash and chocolate! And if you have dietary requirements, you can cook- just like you do at home. We don't have pets (at the moment!) as we're planning to travel extensively overseas and don't think it's fair- but as soon as we've finished our long-haul adventures we will definitely be getting a dog to bring on our travels with us. It's an easy option to include them in your holidays. We also regularly travel with family- we take the van somewhere and they stay in a B & B or hotel nearby. It allows us all to spend time together and explore a new destination. We've met so many motorhomers who strap their surfboards to the roof, their push bikes to the back or tow motorbikes like we do. Others have inflatable kayaks to explore lakes and rivers with or fishing gear or hiking kit. Motorhoming is great for allowing you to enjoy your hobbies and travel to areas where you can enjoy them at their best, wherever that might be. We carry a kayak and a paddleboard with us- we love the freedom of being able to get out on the water whenever we can. Want to park by that pretty river? Or camp next to the lake? There's a high chance there's going to be somewhere you can. Want to park in the middle of a city? If it's not in the UK, no problem! 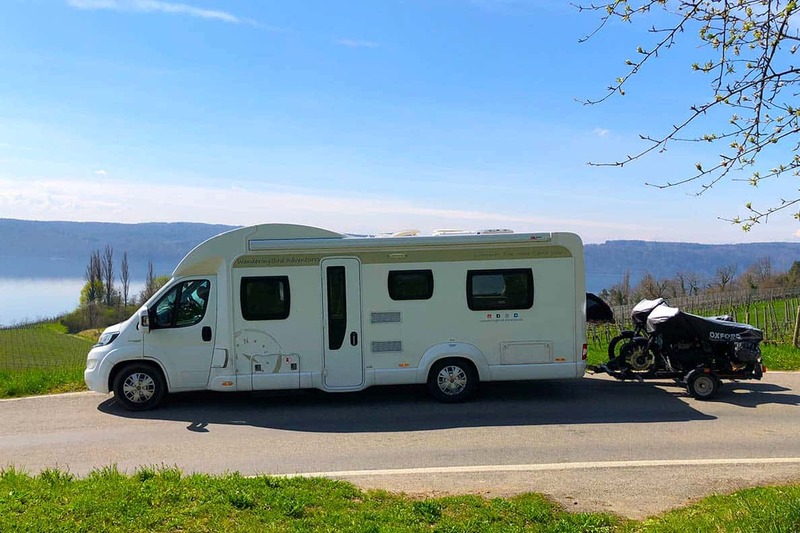 Europe is so well kitted out for Motorhomes, it's possible to stay in THOUSANDS of places and many of them are free and breathtakingly beautiful, or close to major attractions. It's easy in Europe. It's one of the few hobbies/ lifestyles we know of where young couples (that's us…right?? RIGHT?? Hmmm…) mix with families with children of all ages and people enjoying their retirement. It's such an inclusive environment and a pleasure to be part of it. We've met some awesome people of all ages and backgrounds on our travels and it's our favourite thing about motorhome travel. Some of our favourite evenings have been spent around a fire, sharing a beer or 6 with our neighbours for the night and putting the world to rights. It's a lovely community and we're so pleased to be part of it. Camping under the stars and waking up to a breathtaking sunrise is one of my favourite things. Seriously, just look at this view! And this place was FREE for the night! Not just that, but we walk more whilst we're travelling in the motorhome and spend more time outdoors enjoying nature's beauty. Reasons to buy a motorhome- we would NEVER have visited this beautiful place without one! In no way did we believe that one year after buying our first motorhome, we would be living on half our previous income, with me having given up my career and us planning to travel to Norway for 6 weeks over the summer! We'd have said it was impossible. So be warned- buying a motorhome could change your whole life!! You might even end up living full time in your RV?!?! Now wouldn't that be an adventure. Just bought mine. Collecting mid August for a year long trip around Europe, can’t wait. The rough plan is to spend a couple of weeks in the UK, Devon, Cornwall, then across to France down the west coast, across the top of Spain, down through Portugal, Southern Spain, then get to my apartment in Almeria for November/December. Stay in my apartment for a couple of months then head up the east coast of Spain, Italy, Croatia, then maybe Germany, etc. But who knows, plans change 🙂 I’ll be travelling with a girlfriend I dated in the 70’s for a few years. We reconnected last year after 40 years! Should be fun. Yes! We first bought ours for weekend breaks, and still have one as we have two dogs, they come with us, including Continental trips. (We have to do museums in relay, one stays in a cafe or park with dogs, then swap). We love having our own bed and kitchen, no fitting around hotel mealtimes or explaining dietary restrictions! We’ve seen places we’d never have got to otherwise, and met fascinating people. Parking our home by a loch, or under mountains in Bavaria and trying out life there is amazing. We bought our motorhome two years ago in France (we live there) and have visited almost all of Spain and parts of Portugal and heading to the italian lakes in September. Being retired allows us to spend lots of time on the road, although my other half still teaches on line as we travel. As you say you can park up almost anywhere and discover places you’ve never heard of. Best thing we have ever done. Amazing! We have a small bit of land in France for retiring too at some point. We love it there but there’s so much more of the world to see first! The Italian lakes are BEAUTIFUL! (Although don’t swim in them- they’re all badly polluted) I’m actually working on a couple of posts from our visit there last year- hopefully you find those useful. Maybe see you out there somewhere!! This sounds amazing. I would love to be able to do this… need to learn how to drive first though, haha! Learn to drive!! You will never forget it- so much freedom!! I cannot recommend the Motolug trailer enough- it’s perfect for us! It’s carried our two big heavy motorbikes up some pretty scary roads and done well over 18,000 miles. It’s light enough for me to move around by myself (without the bikes on!!!) and it can be taken apart for easy storage, which is perfect for us when we’re not travelling. You can store it inside the motorhome or in a garage. There are links all over my site to their website- give them a call! They’re a really helpful company. 🙂 You won’t regret your motorhome purchase- especially with a motorbike. Best of both worlds!! Hi Bernard! I’ve always wanted to visit Cape Town- hoping to do that in the next few years! I would suggest looking around. You will pay more for a motorhome from a dealer, but they will also guarantee it for 3/6 months, which gives you greater peace of mind than if you buy it from eBay. I guess it depends how capable you feel to fix any problems which might arise. Feel free to ask any questions- sounds like a grand adventure!! Great blog! We had a caravan for 6 years & had some great trips round the U.K. & Europe in it. However last October we changed to a motorhome and suddenly the world has opened up. 3 months in Spain, a month in the Outer Hebrides and now we’re changing to a bigger bus and the temptation to pack up and hit the road is becoming very strong. There’s something about a motorhome that you don’t get in a caravan (and it’s not just the engine!) It’s a greater sense of freedom, the ability to stop or go with minimal fuss, to wild camp and I’m not really sure what’s stopping us upping and offing long term!